Thanks a million to you all and we look forward to seeing you there. We are a "Ma & Pa" shop.... and proud of it! 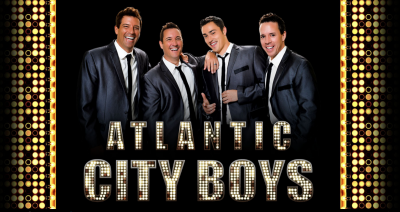 The Atlantic City Boys are four dynamic lead singers who have wowed audiences at Las Vegas, Walt Disney World, Atlantic City, as well as cruise ships around the world. 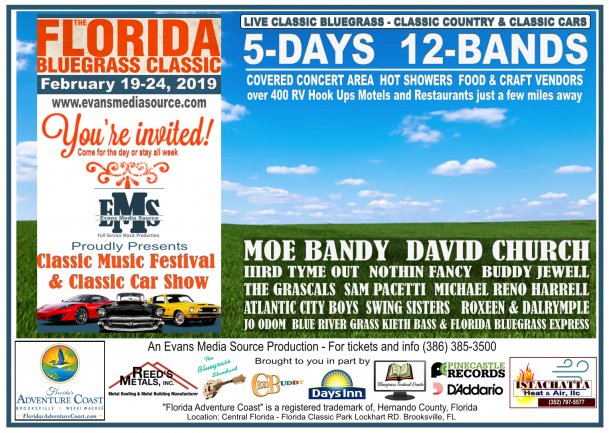 Their show is an exciting mix of world class vocals and interactive comedy -featuring the rock-n-roll harmonies of the Beach Boys, Drifters, the BeeGees, and of course, Frankie Valli and the Four Seasons. The boys have performed with many greats, from Jay Leno to Huey Lewis, Pattie Labelle and the Temptations! Moe Bandy was one of the most popular country singers of the 1970s, turning out a series of hits in the latter half of the decade that made many fans and critics believe he was one of the great honky tonk singers. 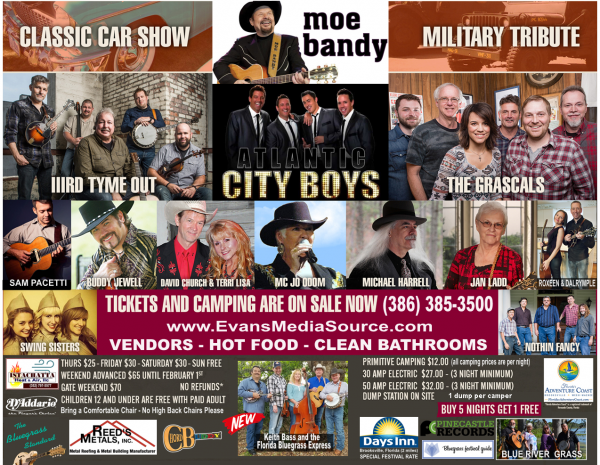 Bandy's songs never strayed far from the traditional barroom fare -- delivered with a knowing sense of humor, loving, cheating, drinking, and patriotic songs form the core of his repertoire. Throughout the late '70s and early '80s, the singer racked up hits. His audience declined somewhat a decade after his career took off, yet he has remained a popular favorite through his theater in Branson, MO. We highly recommend making your camping reservations well in advanced to ensure your site is located in a preferable area. 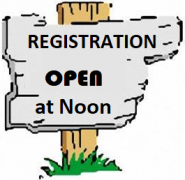 If you have not reserved your spot, Call our office today! Sam Pacetti is one who brings it all together. A fingerstyle guitar wizard. A deft songwriter, capable of haunting depth and wry humor in the space of one song. A impassioned and ecstatic vocalist, as well as a mesmerizing live performer, seamlessly melding head-spinning guitar pyrotechnics and raw emotion into one breathtaking package. This concert is for our early arrivals and what a way to start the week. 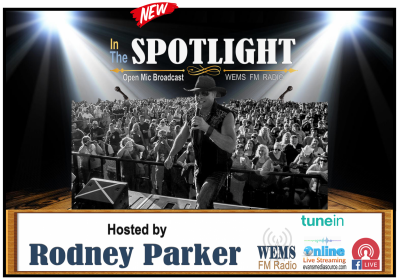 Rodney Parker of WEMS FM will host IN THE SPOTLIGHT open mic radio broadcast for you to try your hand at the BIG stage. This broadcast will be live on WEMS FM and streaming on-line so friends and family at home can hear you. From the iconic "Hank Williams" to his own "roots/retro" country music, David Church has made a huge impact on music enthusiasts all over the world. David & Terri Lisa have reignited a passion for traditional "RETRO" country music. The y have made a connection that has crossed generations, from college students to great grandparents. The "Star" of RFD-TV's "MIDWEST COUNTRY" for over 10 years, David Church, along with his wife, Terri Lisa, have been lighting up the TV sets throughout the US. 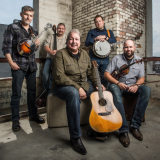 Midwest Country is featured on prime time Saturday night. 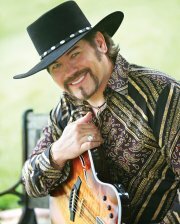 With Nielson ratings in the top 3 on the RFD-TV network, David Church is the "most requested and most popular" artist! 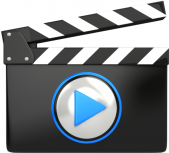 They have captured the hearts of millions from baby boomers to college students. From their dazzling rhinestone suits this dynamic couple has thrilled audiences around the world. David Church is recognized for his authentic rendition of "Hank Williams". And he is recognized by music historians, celebrities, and family members as the "#1 tribute to Hank". Our Classic Car Show has been a big hit every year. Back by popular demand will be our special Military Tribute all happening on Saturday morning. Jan Ladd along with husband Larry Ladd and Marilee Martinson bring the week to a close with respect and camaraderie. 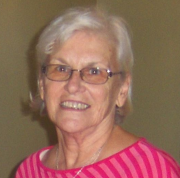 Enjoy a short service with a wonderful gospel sing that everyone participates in. They supply song books and provide accompaniment. Jan encourages everyone to bring an instrument if you have one, a voice to sing along or just the ears to listen and be blessed. As everyone parts and begins their journey home, many talk about this experience being what brought them back or had them looking forward to the next festival.